Central idea: God dwells in the family. Doctrine: The domestic church of the Holy Family. Practical application: Making the family more a domestic church. To view Lectionary 17, click here. Marriage is the natural human vocation and so most people have a natural desire for marriage and children. Abraham and Sarah desired a child, a desire which was frustrated. It was doubly frustrating because of the special vocation God gave him and the promises attached to it: through their progeny, which would be countless, every nation on earth would be blessed. Abraham put his faith in God’s promise and the impossible occurred: Sarah conceived and bore Isaac. R/ The Lord remembers his covenant for ever. By the time of David, Abraham’s offspring had become a nation. God was true to his promises. So, the “hearts that seek the LORD” were not confined to only the chosen people, the children of Abraham. This world-wide dimension came to fruition with the arrival of the Son of God as savior of the world and his commission to his Church to make disciples of all nations. The virtues which St. Paul commends to the Colossians pertain to every Christian family. The mission of the family is to love, and love integrates “compassion, kindness, humility, gentleness and patience,” along with forgiveness, peace, gratitude, and mutual correction. Joseph and Mary recognized the just demands of God by going up to Jerusalem for the Presentation just as they had of Caesar in traveling to Bethlehem for the census. At the same time, this family of slender financial means also completely fulfilled the Mosaic ordinance: Every male that opens the womb shall be consecrated to the Lord. There never was before, or ever would be after, a first-born son who was as dedicated to God the Father, because this first-born son was also God the Son. This savior glorifies the nation of Israel, because as Our Lord said to the Samaritan woman, “salvation comes from the Jews” (Jn 4:22). 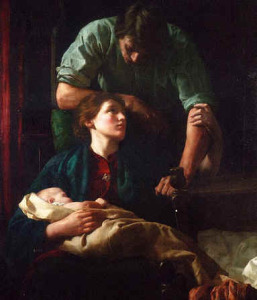 Simeon also says to the child’s mother that she will share in his saving work: “you yourself a sword will pierce.” She accomplished this in accompanying her son during his passion. Just as at one time the entire Chosen People consisted of one man, one woman, and their son—Abraham, Sarah, and Isaac—at one time the entire Church consisted of one man, one woman, and their son—Joseph, Mary, and Jesus. The Church, therefore, began its life in the home of Joseph and Mary. The virtues which St. Paul commends to the Colossians—love which integrates “compassion, kindness, humility, gentleness and patience,” along with forgiveness, peace, gratitude, and mutual correction—were lived out by the Holy Family, even forgiveness. The members of the Holy Family had opportunities to forgive their neighbors, since living in a community they encountered disrespect, violence, impurity, greed, and dishonesty. When that “sword” pierced her heart, the Blessed Virgin Mary had a special opportunity to forgive because of what they did to her son. And of course her son had that mission to forgive every sin. Within the Holy Family, there was no need for Jesus, Mary, and Joseph to forgive one another due to sin. Even so, it is possible there were misunderstandings that led to pain, as when Joseph learned that Mary was with child or when Mary and Joseph lost Jesus for three days. As the Catechism points out, every Christian family is already a domestic Church. Marriage and the family is the arena in which spouses can learn to love and can teach the Gospel, live charity, and train their children in virtue. In your family, is the faith proclaimed to your children by word and deed? Have your children ever heard you utter the word Jesus in your home? Do they hear you speak of God and the Gospel? Do they see over time that being a Catholic means you live differently? Is your home a community of grace? Objectively, you have the graces of Baptism, Confirmation, and Marriage, but are they stopped up by not keeping the Sunday obligation or by reception of the Holy Eucharist unworthily? Is your home being poisoned by contraception? Is it a community of prayer? We are to teach our children to have a relationship with God through a life of prayer so they can eventually discern their vocations. Do you offer your day to God and have you taught your children how to do this? Do you say grace before meals? Is there any other family prayer you practice together? Is your home a school of human virtues? Do you and your spouse try to live, model, and train your children in the love which integrates “compassion, kindness, humility, gentleness and patience,” along with forgiveness, peace, gratitude, and mutual correction? Is it a place where freedom is cultivated? Young children can be forced to do what you want when you are standing over them, but will they want to do what is right when you are not watching them or when they leave home? Is it a school of Christian charity? [*] “Love Is Our Mission: The Family Fully Alive,” the preparatory catechesis for the World Meeting of Families in 2015.